Aside from being beautiful trees used during Christmastime, pine trees also offer medicinal qualities. Scots pine in particular has several traditional uses. The Scots pine formed large parts of forests in northern England and Scotland until around 8,000 years ago. Scots pines form the foundation of the native pinewoods of Scotland, and are vital for wildlife conservation. Only a small portion of the original forests still exist, after much of them were burned for fuel from the Roman conquest onwards. In additional to herbal remedies, Scots pine was traditionally used to make ships, tar, charcoal, and turpentine. Reducing inflammation. 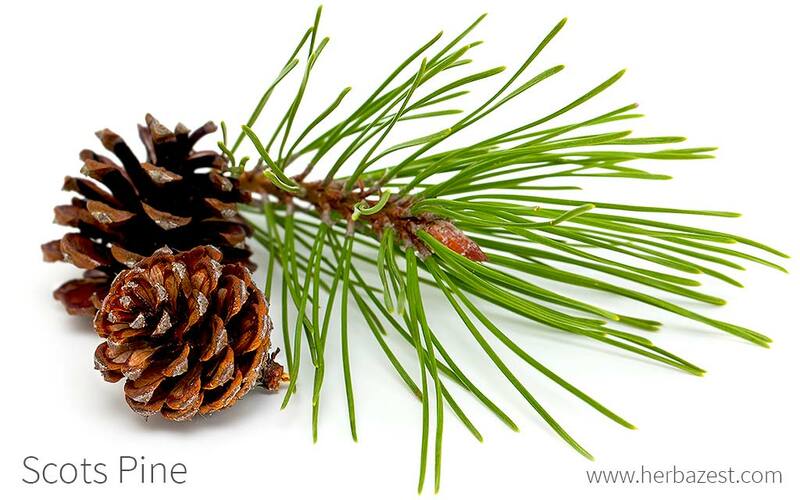 Scots pine has been traditionally used for treating inflammatory processes of the upper and lower respiratory tract, as well as for the relief of rheumatic and neuralgic pain. Treating infections. The antimicrobial properties of scots pine have been long used for eliminating fungus and bacteria, as well as for the treatment of common infections, such as cold and influenza. Additionally, scots pine's antioxidant action have been shown some influence in preventing cellular damage caused by free radicals, which have been linked to many age-related, degenerative diseases. The bark of scots pine contains at least 28 phenolic compounds, which have anti-inflammatory properties, mainly a-pinene and b-pinene. These phenols have been shown to inhibit the production of two inflammatory compounds, nitric oxide and prostaglandin E2. The disulfide-rich proteins in Scots pine sap have been shown to bind to glucans, which make up the cell walls of fungi. This may be effective in eliminating some types of fungi. SCOTS PINE CONTAINS THREE DISTINCT BIOACTIVE LIGNANS, AS WELL AS PROANTHOCYANINS, A CLASS OF ANTIOXIDANT PIGMENTS. Antifungal properties can also be found in herbs like neem and Oregon grape, whereas eucalyptus is great for treating respiratory problems, and turmeric is well-known for relieving joint pain and inflammation. There are not known side effects due to scots pine use: however, it may cause an allergic reaction in sensitive people, mainly skin irritation when applied topically. The use of scots pine in any form is not recommended for pregnant or nursing women. Essential oil. Only for topical use, scots pine essential oil is useful for treating skin problems, such as fungal infections and local inflammation. The oil must be diluted before application. Capsules. Supplemental forms of scots pine can be found as tablets and gel capsules. Also known as 'turpentine', pine essential oil, as well as pine capsules, can be easily found online, as well as in specialized health stores and some pharmacies. These supplements are commonly hailed for their antioxidant content. Some products labeled as "pine bark" may contain an extract from any one of several different pine species - namely P. pinaster - so it is advised to check the labels carefully. Scots pines are relatively low maintenance trees to grow and they do well with cool summer climates, which is why they primarily grow in the Northern Hemisphere. Scots pines require full sun and prefer well-drained soils, although they can tolerate dry soil. Trees should be planted 14 feet (4.25 m) apart. THERE IS A SCOTS PINE IN SWEDEN'S MUDDUS NATIONAL PARK BELIEVED TO BE OVER 700 YEARS OLD. Scots pine (Pinus sylvestris) is a hardwood tree that can grow up to 100 feet (30 m) tall. It has reddish brown bark and needle-like blue-green leaves, and it produces small, spherical cones. Pinecones are egg-shaped with woody scales that protect the seeds inside. Pine trees are part of the Pinaceae family, which encompasses up to 250 species of coniferous trees and shrubs, divided into 11 genera. The Pinus genus is made up of approximately 150 species of coniferous trees. Contemporary taxonomists recognize up to five or six different varieties of Pinus sylvestris, although at some point, almost 100 of them had been described. Most of these varieties are very similar-looking, differing mostly in their resin composition. The most abundant variety is P. sylvestris var. sylvestris, which can be found from Scotland to Spain and Siberia. In addition, var. hamata, which grows mostly in the Balkans, Caucasus, and Crimea; var. mongolica, which grows in Southern Siberia and Northwestern China; var. nevadensis, confined to Southern Spain (the Sierra Nevada); and var. cretacea, which grows between eastern Ukraine and western Russia, are all agreed upon as distinct varieties by experts. On the other hand, controversy still exists regarding P. sylvestris var. lapponica, which grows in extreme northern areas of Europe, and is sometimes thought to be part of the sylvestris variety. The main economic value of Scots pines lies in the timber industry, since their soft, reddish wood is widely used for home furniture. The pulp is also used for making paper. In the United States, they have added seasonal value as live holiday decor: approximately 30% of the 35 million Christmas trees harvested and sold annually belong to the Pinus sylvestris species. China currently leads world production of pine trees. Timber. Scots pine trees are highly valued for making furniture and building various other structures, such as roof beams, furniture, fences, doorways, and stairs. Ornamental. Scots pine trees are popularly used for Christmas trees, but they are also commonly planted along roadsides. Paper. Scots pine pulp is often made into paper. Industrial. Scots pine's resin was traditionally made into tar, and is still made into turpentine, which is the volatile oil distilled from pine resin.